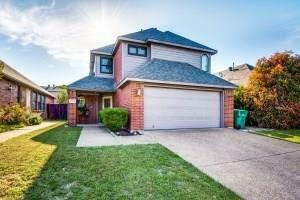 Really cute home in Hunters Glen of Lewisville Highland Village area. Master on main level and two bedrooms, Loft, and bath upstairs. Main level living room, dining, enhanced by a fireplace with gas logs. Sporting beautiful hard surfaced flooring on main level and a beautiful chandelier over the dining area, the home lives big. Laundry and powder room is a separate room conveniently located on main level. Make this home yours ready to close end of May, 2019.